Area : 5628 sq. km. Temperature : Max. 43°C and Min. 35°C in Summer. Max. 30°C and Min. 5°C in Winter. Best Season : August to February. Bundi is a tiny picturesque town. One of the unexplored cities with rich historical wealth. Once a part of Kota, it was ruled by the Hada Chauhans, an offshoot of the famous Chauhan clan who ruled Delhi and Ajmer. In 1193 A.D., when Prithivi Raj Chauhan was defeated by Sultan Mohammed Ghauri, some Chauhan nobles’ seeked shelter in Mewar and became allies to the Rana while other young warriors moved towards the Chambal valley and overpowered the Meena and Bhil tribals, thus establishing their own kingdom of Hadoti. Later, two branches of had as formed two separate states of Kota and Bundi, on either side of the River Chambal. Bundi is surrounded by the Aravalli hills on three sides and is circumscribed by a massive wall with four gateways. Interesting monuments including impressive medieval forts, palaces, havelis, temples with beautiful stone idols and Chattris with carved pillars, along with a picturesque lake in the heart of the town, add to its charm. 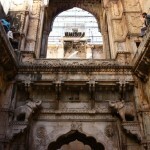 Bundi is very famous for its intricate carvings and murals. Air: Nearest airport is Jaipur (206 km). Rail: Nearest railhead is Kota (36 km). Road: Good road connections link Bundi with important places around. Chhattar Mahal or Palace of Towers: It was built in 1660 by Rao Raja Chattar Sal. The monument is approached through a step, paved carriage way. The Hazari Pol or gate of thousands, Nanbal-Khana, the Hathi Pol with its curious old water clock and Diwan-i-Am are some of special interest. The Palace: This magnificent edifice is a fine example of pure Rajput architecture, housing some of the superb Bundi murals. Sukh Mahal: A magnificent summer palace on the Sukh Sagar lake amid the lush surroundings of a beautiful garden. An underground tunnel is believed to run from the Sukh Mahal to old palace. Taragarh Fort: Built in 1354 A.D., the impressive white fort crowning the thickly wooded hill. The huge water reservoirs inside the fort which once supplied water to the palace are noteworthy. Nawal Sagar: Visible from the fort is the square artificial lake of Nawab Sagar, broken up by islets. A temple dedicated to Varuna, the Aryan god of water, stands half s ubmerged in the centre of the lake. The reflection of the entire city and its palaces can be seen in the lake, making it a unique attraction of Bundi. Phool Sagar: The 20th century palace an artificial tank and picturesque gardens. Presently, it is residence of the former ruler. Prior permission of secretary is required for a visit. Kshar Bagh: An ancient garden near the Shikar Burj with beautiful chhatris of the Bundi rulers and their queens, all examples of the town’s rich architecture. Prior permission is required for visit. Chitra Shala: A beautiful pavilion and a gallery inside the palace decorated with miniature paintings and murals. Paintings on the walls depict scenes from the ‘Rangamala’ and ‘Rashlila. Permission is required to see the Chitra Shala. Ratan Daulat: Built by Rao Raja Ratan Singh, it is a very interesting structure forming a stable for nine horses and a Hatia Pol. Prior permission required for visit. Raniji-Ki-Baori: IIt is 46 mts deep stepped well with some superb carvings on its pillars and a high arched gate built in 1699 A.D. by Rani Nathavatji. This well is one of the largest of its kind. Shikar Burj: The royal hunting lodge set amidst the lush surroundings. It is a favourite picnic spot. Eighty-Four Pillared Cenotaph: An amazingly magnificent memorial with 84 pillars in a single cenotaph along with a Shiva lingam. It was erected by Rao Anirudh. Jait Sagar Lake: Situated 3 km away from Bundi in Rajasthan. 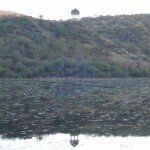 A picturesque lake cradled in the hills, built by Jaita Meena. The swirling fountain at night is a visual delight. 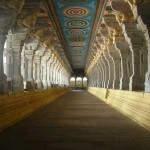 Rameshwaram: Rameshwaram is situated 20 km from Bundi. The cave temple of Lord Shiva surrounded by the Aravalli ranges. An ideal picnic spot as well. 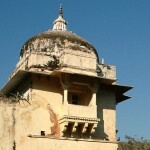 Keshavraipatan: Keshavraipatan is situated 45 km from Bundi. It is an ancient city famous for the temple of Lord Vishnu. The architecture and sculpture at this temple is unique. 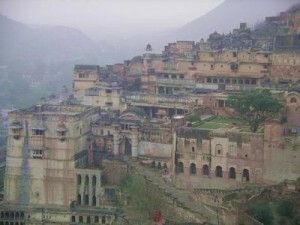 It was constructed in the year 1601 A.D.
Ramgarh: Ramgarh is situated 45 km from Bundi. The Ramgarh Sanctuary is located on the Nainwa road. One needs to take permission of the state forest department prior to visit to the sanctuary. 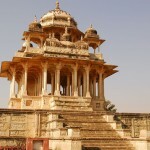 Talwas: Talwas is situated 53 km from Bundi A magnificent fort built by the ruler Ajit Singh. A temple of Dhooleshwar Mahadev and a picturesque waterfall adjoining the fort are worth a visit. The beautiful Ratna Sagar Lake is close by and is a haven for fauna like bear and deer during the monsoon. Dugari:Dugari is situated 65 km from Bundi Remnants of ancient wall paintings can be seen in the Ram mandir within the imposing fort of Dugari. Indragarh: Indragarh is situated 77 km from Bundi The Indragarh fort and the nearby palaces are famous for the temples of Mother Goddess Kali and Kamleshwar. The palace is also famous for wall paintings. This entry was posted in Bundi, Rajasthan and tagged Bundi, bundi fort, bundi map, bundi palace, bundi tourism, bundy, Chhattar Mahal or Palace of Towers, Chitra Shala, Dugari, Eighty-Four Pillared Cenotaph, Indragarh, Jait Sagar Lake, Keshavraipatan, Kshar Bagh, Nawal Sagar, Phool Sagar, Rameshwaram, Ramgarh, Raniji-Ki-Baori, Ratan Daulat, Shikar Burj, Sukh Mahal, Talwas, Taragarh Fort, The Palace. Bookmark the permalink.